What do you mean Meerkats can’t be Support Workers? Well, I suppose they can’t reach door handles, or make food, or lift anything above our knees. Perhaps they can’t join the VP Forensic employee list, but they were the perfect antidote to the Monday morning blues. Fred, Betty & Barney are three energetic meerkats brought to us by Hawks of Steele. Their handlers informed us that these siblings had been abandoned by their parents shortly after birth and sadly the pups were losing weight, being ignored and on their way to the meerkats’ pearly gates. So they rescued and hand reared the litter, morphing the siblings into exciting curious meerkats who enjoy the company of humans. It was our Director, Phil Walters, who first saw the meerkats whilst visiting Hawks of Steele. After asking a couple of questions he decided to give our clients the opportunity to meet these wonderful creatures. We admit that inviting meerkats into our office appears to be random. And yes, it could be a veiled excuse to play with some cute animals. However, after seeing our clients and their support team coming together, playing with the meerkats, meeting new people, it started to make more sense. For people with a mental health illness, learning disability or an acquired brain injury, new experiences can be difficult to undertake. Without a safe environment to be in and their required support network, new experiences can be unenjoyable and intimidating. 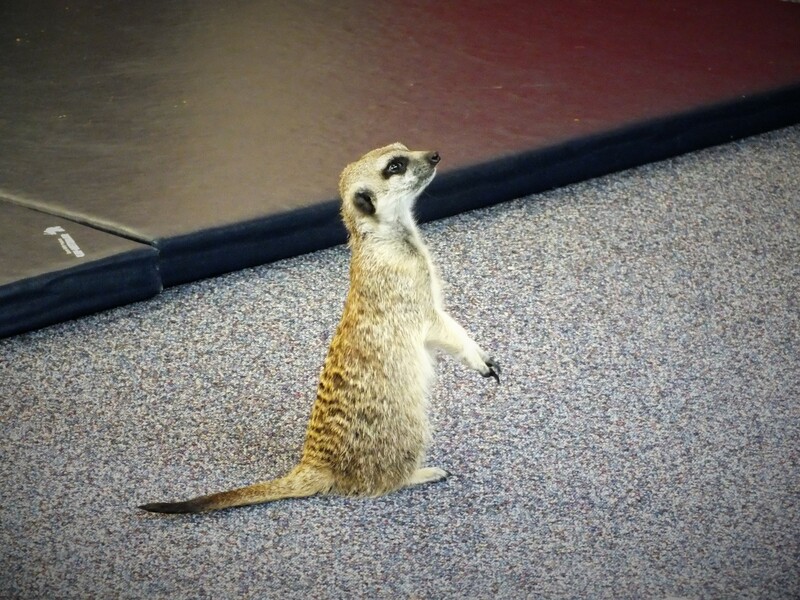 With the meerkat visit booked Phil extended the invitation to our clients to come meet these marvellous creatures. Yes, this made the office staff extremely happy – but more importantly, Phil encouraged our clients to meet one another; people with a variety of abilities, in one room, enjoying the same activity. What I saw was a day where clients and support workers could mingle and share a similar experience. The meerkats broke down any inhibitions and barriers we all had, they climbed on tables, heads, wheelchairs and climbed into a couple of handbags escaping with anything shiny they could find! Every single person left with a smile on their face and perhaps our clients grew in confidence. We hope that they are encouraged to try out other activities. Overall I left work that day, feeling like I was part of a community. The focus was on engagement and laughter, not on KPIs or profit. On reflection, I am happy to know that I work for a company who effortlessly embody that disabilities are not limitations. This ethos is spearheaded by our Director. In arranging a seemingly simple event, Phil thought outside the box to connect and encourage our clients. It was with the help of the most unlikely creature that the day was a success. Thank you to all that attended and enjoyed the hilarious antics of meerkats.